Have you been thinking about investing in an air purifier but are not sure if it’s really worth the investment? With all of the talk about how poor indoor air quality is inside our homes, how do you really know if the air that you’re breathing is that bad or not? The answer to that question comes in the form a product called the Foobot. Particulate matter (PM) is especially dangerous to your health because long-term exposure can produce respiratory issues, damage to the brain damage and central nervous system, or death. PM is made up of things like dust, dirt, soot, and smoke that come from automobiles and factories. These particles easily get trapped indoors and are invisible to the naked eye. Volatile organic compounds (VOCs) are another thing that is present in every home. Exposure to these compounds can cause short and long-term effects such as headaches, nausea, liver damage, and cancer. VOCs come from indoor cleaning agents, paints, varnishes, building materials, furniture, and more. Carbon dioxide (C02) is most associated with humans. As we exhale, C02 is emitted into the air. Normally, this is not much of an issue but if you live in a crowded space it could be harmful to your health. Oher sources for C02 buildup inside your home come from the soil outside and faulty air conditioning systems. Humidity becomes a concern when it’s too high indoors. High humidity levels cause mold and mildew to grow as well as damages wood an metal materials. Humidity also affects the lungs and makes it harder to breathe for people with asthma and allergies. Temperature is self-explanatory. It tells you how hot or cold the air is inside your home. Setting up Foobot is easy to do and only takes a few minutes. Once you take it out of the package, you simply plug it in and then download the associated app onto your mobile device. Then, all you have to do is connect it to your home wireless network and you’re done. 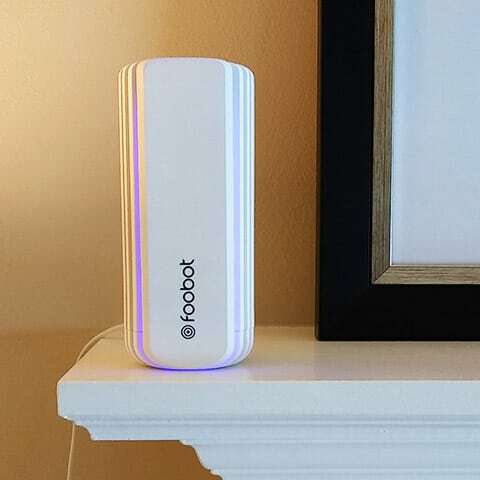 After setup is complete, Foobot takes about six days for it to gather the baseline data inside your house for each of the air quality concerns listed above. Once the device has calibrated, you’ll know the exact levels of each air pollutant monitoring will continue in real-time. On the main screen of the app, you’ll see an overall rating for the air quality (0-100). A lower number is better. When we tested it, the air quality was at a 12, which is great. You’ll also see the individual data for each particulate being tracked as well as humidity and temperature. Tapping on the icon will bring up that data for you to view. One of the best parts about the Foobot is that data is recorded down to the minute and can be accessed via the history log. This is a very convenient feature because it shows you how the air quality, humidity and temperature changes throughout the day, weeks, and months. This can help you spot any trends that may be happening inside your home. Foobot also tracks the outdoor pollution for your local area through a service called BreezoMeter. 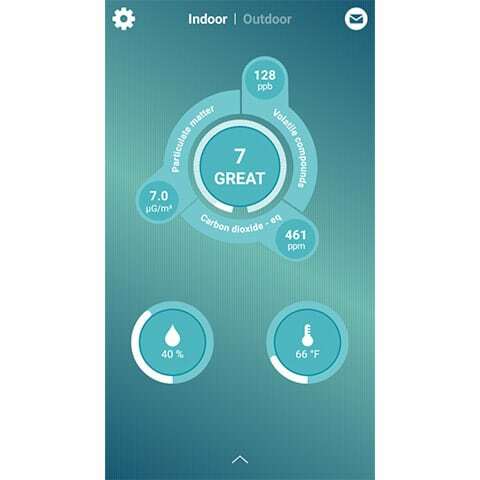 You can instantly find out how poor or great the air is outside your home by a simple tap on the screen. This is a nice feature to have and gives you an accurate gauge of what the outside environment is like around you. That way you can take any necessary steps for staying healthy if the air quality is bad. A feature that stood out most to us on the Foobot is a colored LED light. This light indicates the current air quality inside your home. It changes from blue to orange and ranges in intensity level by the length of the light. A long line of blue indicates great air. A short line of blue is considered good air. A short line of orange indicates air quality is moving into the bad zone. A long line of orange means the air is very toxic and something should be done immediately to improve it. In addition to the visual LED light indicator, the Foobot mobile app also alerts you to any air quality issues through push notifications. During our test, we didn’t experience these alerts since our air stayed clean. We use air purifiers in our office, so this made sense. However, after two weeks we did receive an email from our Foobot that gave us a recap of our air quality over that period of time. This was a nice touch. It’s also important to point out that the LED light brightness and app push notifications can be adjusted in the app settings. The LED light can also be set on a timer if you don’t want it shining 24 hours a day. All-in-all, the Foobot is a great little device to have around the home. It quickly tells you what contaminants are invading your breathing space and how much of each particle is floating around too. The only problem downside of the Foobot is that it doesn’t do anything to help fix the air quality. All it does is alert you to issue and it’s then up to you to find a solution. For each air quality concern, there is a tab that offers some tips on how to lower the level of exposure. However, we felt that this area of the Foobot could really be improved upon. The tips offered are pretty basic and as far as we could tell they don’t ever change or rotate. Cooking releases particles in the air due to combustion, especially with gas stoves. It causes headaches and nausea. Choose electrical stoves as they emit fewer particles. Always use an exhaust hood while & after cooking ventilate the air. As you can tell, this advice is specific to only cooking in a kitchen. We tested our Foobot in an office setting, so this tip didn’t apply. It also leaves out any mention of particulate matter coming from other sources such as automobile exhaust, factory smoke, etc. which is a real concern for people who live in urban areas. 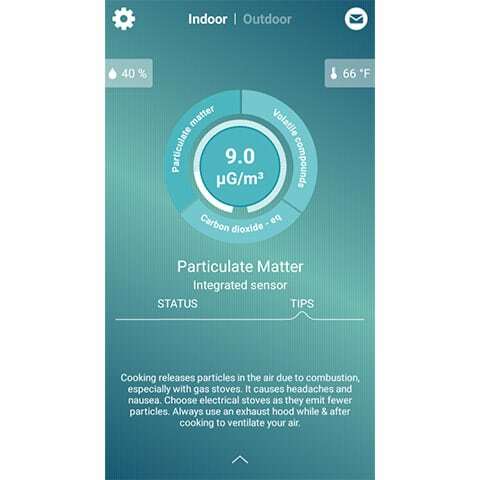 You would think that the Foobot would offer additional tips on how to seal up your home to prevent particulate matter from getting in and ways to remove it from your house like using an air purifier. Breathing contaminated air is a major concern for every human being, and many people are exposed to hazardous levels of indoor toxins without even knowing it. As you can see, the Foobot is a unique device that uncovers the invisible pollutants that may be lurking around your home and secretly causing you to get sick, or worse, develop serious health issues. Knowing what’s inside the air you breathe is first step staying healthy at home. If necessary, you can then look into potential solutions for improving the air quality around you.